This slab of wax from Ireland’s Bad Boat is released almost in tandem with the Howlin’ Widow 7” on Freak Flag Recordings. Interestingly both bands employ the services of vocalist Tom Clarke but where Howlin’ Widow threw themselves into a retro rock and roll frenzy, Bad Boat operate further towards the doom end of the scale. Originally these tracks saw a limited CD release in 2009 before the band’s dissolution but with the Boat sailing once more it is now getting the full vinyl treatment. There is some stylistic crossover with Howlin’ Widow as both bands cast an eye back to the 70’s but the Bad Boat sound is noticeably darker and heavier. Opening track “Lonely Doom” lurches between mighty crushing riffs to a full on Sabbath styled rock out meltdown all topped off with Clarke’s manic yet melodic vocal stylings. When you think you have this band pegged, however, next track “Mechanical World” is a cover by renowned psychedelic pioneers Spirit and a very brave move. Admittedly I’ve never heard the original but I’m guessing it didn’t sound like this!!! That said this definitely works and shows that Bad Boat are no mere doom copyists and willing to stretch out and try something left of centre. Clarke here is fine voice as he pilots the Boat through this Spirited cover…enough puns now!!! Flipping this over and the epically lengthy “Lucky To Be Breathing” starts all atmospheric, clean guitars that have overtones of psychedelia and Goth in equal measure. An interesting move for sure but one that shows that Bad boat aren’t content to wallow in doom clichés and look to expand the envelope. Even as the track builds in intensity and heaviness it has a whiff of early Cult about it, albeit raised on Mogadon and Sabbath. Finally the record closes with “Uphill Struggle” which sees the band return to more familiar doom laden territory with nods towards Saint Vitus in its open, chord based groove but never losing sight of its inherent melodicism and sense of the epic. 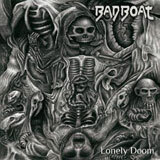 In a genre that is rife with copyists and an alarming dearth of originality, Bad Boat do offer something a little different and a lot interesting that very much makes them worthy of further investigation. If you like your doom with a few shots of extra flavouring this may well be the kind of thing you’ve been looking for though be warned, like so many of the best albums it is a record that only really seems to make full sense a few spins in.